"I long for the rural and domestic scene, for the warbling of birds and the prattling of my children." encourages gratitude, and also helps to create and strengthen family bonds and traditions. that you are reading this right now. 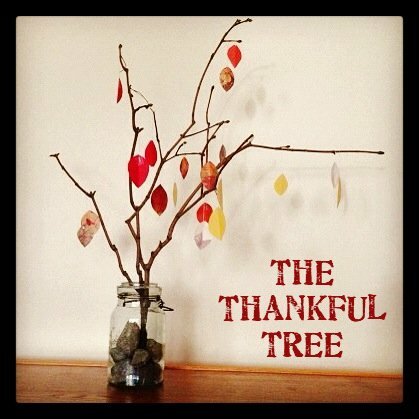 A Thankful Tree is the perfect way to encourage thankfulness! This project consists of a table-top sized natural tree branch "tree" that you can easily create. the opportunity to add a leaf to the tree. consider tying the branches together near the bottoms with twine. 3. Make a small slit at the end of each leaf and thread a 3-4" length of string onto each leaf. 4. Have family members write something that they are thankful for onto a leaf and hang it on the tree. Thanksgiving - Use autumn colored papers for the leaves. the branches with white spray paint. on one side with glue and silver glitter. thankful for the birthday girl or boy onto the leaves. This post is part of BlogHer's Holiday Parties editorial series, brought to you by Cracker Barrel.